To The Most Epic Of Alaska Float Trip Waters! 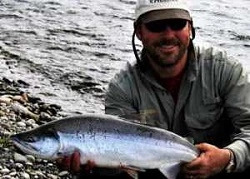 Alaska is a fishing destination with boundless opportunities for the traveling fly fishing or tackle angler, a dream destination for many, and one to which those who have fished Alaska before, desire to return. 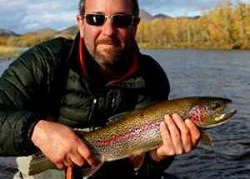 Whichever you are, many of it's best locales in which to wet a line are on the list of Alaska float fishing waters that we at Alaska Rainbow Adventures can take you to while on one of our Alaska float fishing trips. We can have you on these waters at the peak of the salmon runs and at times when availability is highest for native species, grayling, char and the rainbow trout for which our trips are famous. The float fishing trips that Alaska Rainbow Adventures offers have become the benchmark by which other float trips are measured and according to our guests that have been with other outfitters in the past, none come close to matching our Alaska programs! With friendly, knowledgeable guides that treat you like family, the most comfortable camps in the industry that are a welcome respite after a day on the water, exceptional meals, attention to detail and of course the fishing! These are just some of the qualities that keep our guests coming back year after year, why not join us this year and let us show you why Alaska Rainbow Adventures is among the most experienced outfitters you can utilize when visiting the 49th state! The Alaska fishing season is relatively short and revolves for the most part around the life cycle of the five species of Pacific salmon which arrive in Alaska's rivers at different times not only through the season but at periods that can vary from river to river. 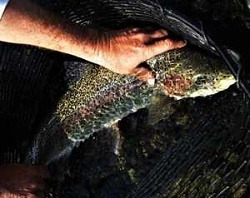 This availability of the salmon and whether they are pre-spawn, actively spawning and dropping eggs, or post spawn can strongly influence the behavior of resident species, the rainbow trout, grayling and char, and their availability to anglers in a particular watershed as they follow the life dance of the salmon. This very availability of the salmon and what they are doing goes far to explain how a particular week one season can offer average fishing yet the same week the next year or even week can be epic. No matter when you are here we will put you on the best fishing holes, one after another all day long as you to present your hook to fish in the most effective way from one of our custom inflatable boats or while wading, and while doing so you will get to experience the whole of the rivers we float, rather than just a few miles from the lodge. Much of this will be where jet boats and airplanes simply can not go and along the way see wildlife in their natural surroundings without being run off by the sound of an approaching engine. Come with us on one of our multi-day wilderness float fishing trips and experience Alaska's World Class float fishing waters such as the Arolik, Kanektok, Goodnews, Togiak, Alagnak, Moraine and more, each offering a unique experience for traveling anglers no matter your level of experience. Which trip is right for you? Just ask, we will be happy to help you select the one that is the best fit for your group's interests and desires. We look forward to serving you and thank you for your time. weeks of our lives floating the Goodnews River. My husband and I shared a great week of floating on the Kanektok River. so we could experience the un-spoiled country side. I still feel as if I stepped off the Goodnews River only yesterday. I remain overwhelmed in a way that is hard to describe to people at home. In short, the trip far exceeded even my wildest expectations. I am very happy with my choice of Alaska Rainbow Adventures. The combination of the location and the people made the difference. but it was refreshing to experience both at once in such a remote place. The experience was everything I expected. that I would definitely recommend and I plan on using again in the future. You can now read about many of the Alaska float fishing trips we offer in our new float trip catalog available in online magazine format! That this is probably best viewed on a tablet or desktop computer but we know those of you with mobile phones are going to check it out anyway. 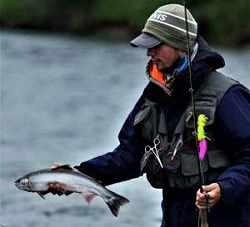 Alaska is brimming with a profusion of rivers, streams and creeks that are perfect for an Alaska fly fishing float trip that are by and large packed with a wide range of freshwater species that anglers from all over the globe come here to pursue. However, nothing other than actually being here begins to do the Alaska float trip experience justice, no matter how many photos, stories or web sites you have checked out, being here is so much more! Here are some of the more popular of these "Epic" Alaska float fishing trip waters that we can take you to. The Alagnak River is located in the Bristol Bay / Katmai NP Region of Alaska and accessed from King Salmon, Alaska. The headwaters of the Alagnak Wild River lie within the rugged Aleutian Range bordering on or in part within Katmai National Park & Preserve from which they meander west towards Bristol Bay. 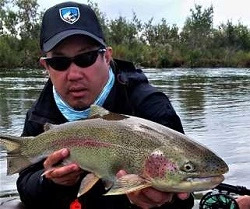 The Alagnak fishes well for all five species of Pacific Salmon, mixed in with all of the salmon are enough rainbows to make it seem like they are a run of their own as well as Arctic Grayling and Dolly Varden. On the Alagnak, there are no crowded fishing holes. American Creek is located in the Bristol Bay / Katmai NP Region of Alaska and accessed from King Salmon, Alaska. One of the only waters we float that is actually located within Katmai National Park, American Creek offers at times abundant Rainbow Trout and Dolly Varden. Access is limited to a few miles at the lower end by jet boat and walking at the headwaters lake by anglers who walk in after being dropped off by float plane usually from one of the areas lodges. The rest of the American is the realm of those who float it and we have been offering trips here for over twenty years. The Arolik River is Located in South West Alaska and is accessed out of Bethel or Dillingham, Alaska. The Arolik River is remote, the fish are abundant, and the scenery is beautiful and while the Arolik starts off small it finishes big, and if you time it right, you might even tie into all five pacific salmon species, dolly varden, grayling and some very old rainbows! The Goodnews River is located in Southwest Alaska and can be accessed out of Bethel or Dillingham, Alaska. Located in southwest Alaska and flowing out of the Ahklun Mountains to the Bering Sea, the Goodnews River offers some of southwest Alaska’s most productive and varied stream fishing for all species of salmon, trout, grayling and sea-run Dolly Varden, the river is choked with fish in the summer months is an ideal trip for families and angling friends This is true wilderness, with the upper portion of the Goodnews River being within the Togiak National Wildlife Refuge. The Kanektok River is located in the Togiak National Wildlife Reserve of Southwest Alaska and flows westward out of Pegati Lake and the scenic Ahklun Mountains about a hundred river miles and into the Bering Sea at the village of Quinhagak. Almost all the river’s course lies within the Togiak National Wildlife Refuge, and it is a fly fisherman's paradise and a world class fishing destination. The Kwethluk River flowing out of the Kilbuck Mountains winds along for nearly a hundred miles of fish, fun and solitude flowing through the twisty shallows of the mountainous upper stretches, wood-laden braids and channels of the mid river, to the slow flowing oxbows as it nears the Kuskokwim River all of which offer something to the wilderness angler and if you give the trip enough time you will not be disappointed in having to hurry up through it's lower reaches. Moraine Creek is located in the Katmai / Bristol Bay region of Alaska and accessed from King Salmon, Alaska. 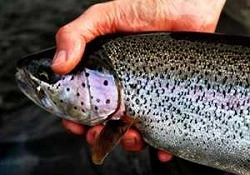 While at times busy with anglers from all over, if you are on a float trip and camped right along the river you can be on the water before and after the majority of these tempoary interlopers from the lodges on tbis short yet highly productive water where behomoth rainbows reside. Bring a good camera, you will need it not only to document your catch, but the local wildiife viewing is out of this world and worth the price of admission. 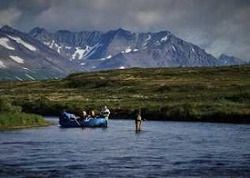 The Talachulitna River is accessed out of Anchorage and it is our most economical Alaska float fishing trip. The Talachulitna River fondly also known as the Tal winds some fifty to sixty miles from Judd Lake and the Tordilo mountains to the Skwentna river. While on Talachulitna Creek portion you will see no motorboats as it is designated non-motorized for most of the summer. It was also the first river in Alaska to be designated catch and release only for Rainbow Trout. Anglers can also expect to catch Arctic Grayling along with King Salmon, Sockeye Salmon, and Silver Salmon depending upon when you time your trip with us. The Togiak River is the Gem of the Togiak National Wildlife Refuge and accessed out of Dillingham, Alaska. 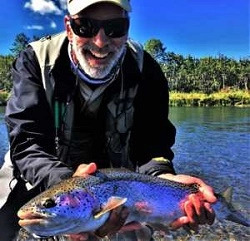 We have been offering trips on the spectacular Togiak River longer than any operator on the river and while not as popular as it's sister rivers to the west, the Togiak is more then worthy of a look for the traveling angler. It is in the top ten waters in the state for Trophy Rainbow trout, and has one of the largest unexploited runs of coho salmon. Greetings from Alaska... My name is Paul Hansen and I am the owner of Alaska Rainbow Adventures. 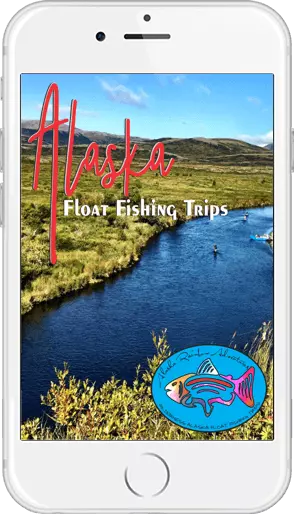 My guides and I have been operating the premier multi-day wilderness fly in Alaska float fishing trips on many of Alaska's best float trip waters for what will be our twenty seventh season in 2019 and do so offering you the traveling angler a level of service not found elsewhere in the industry, we invite you to join us for your Alaska Float Fishing Trip. 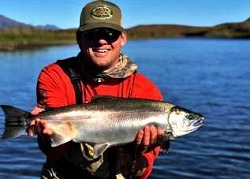 You can watch more videos from our Alaska float fishing trips, "Click here"